For my first post of the day, I’m going to do a little shameless bragging. 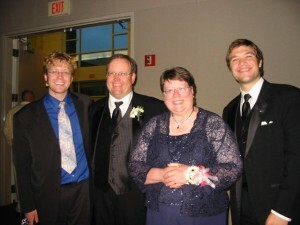 Longtime TWO readers know that I have a soft spot in my heart for pro-equality parents of LGBT children. I often call them “equality moms,” since I know far more women than men who fit this description, but I suppose I really should find a more inclusive term. But whatever one calls them, hell hath no fury like a parent fighting for their LGBT child. In my experience, equality parents are often able to reach out even to hardened homophobes who wouldn’t be receptive to a pro-equality message from one of us LGBT folk. After all, who (other than a sociopath) can’t relate, at least on some level, to the love of a parent for their child? And when parents choose to affirm and embrace their LGBT children and trust the truth of their child’s identity, they may also quite literally be saving the child’s life: a 2009 study by San Francisco State University researcher Caitlin Ryan published a study in the Journal of the American Academy of Pediatrics that found that LGBT teens who experienced negative feedback from their family were 3 times more likely to use drugs, 6 times more vulnerable to severe depression, and 8 times more likely to have attempted suicide than their peers. 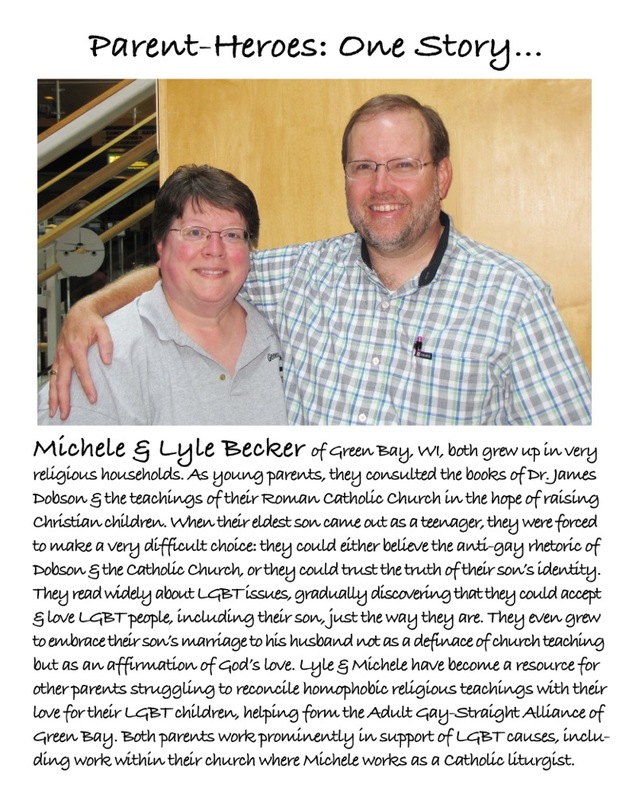 And now, for the shameless bragging: yesterday my hometown newspaper, the Green Bay Press-Gazette, ran a front-page story about the Adult Gay-Straight Alliance of Green Bay (A-GSA) — a group for parents of LGBT children that my parents, Lyle and Michele Becker, were instrumental in founding — that used their own personal journeys to full acceptance as the springboard from which to tell the story. “You think to yourself, ‘Should I tell anybody at work? What will they say?’” recalled Becker, 54, whose son John, the eldest of four boys, told Becker and her husband Lyle that he was gay earlier that summer after he graduated Green Bay East High School. He was 18. After finding out, Becker cried and prayed — a lot. She later came to believe her son was born gay. She said parents in her situation often fear what others will think if they have a child who is lesbian, gay, bisexual or transgender. 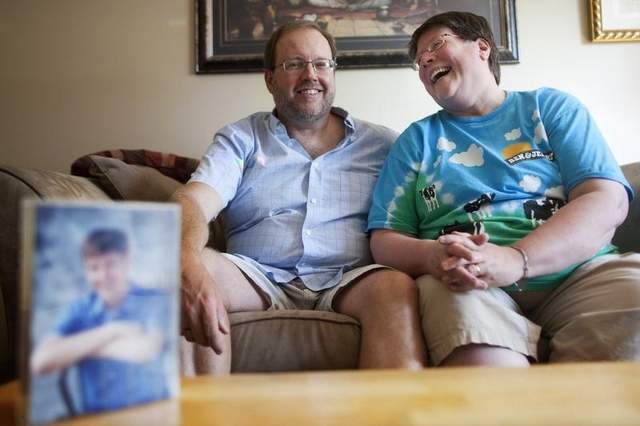 “Parents are struggling with their own coming out as a parent of an LGBT child,” she said. Roman Catholic teachings assert that homosexual behavior is immoral, though Catholics are taught to treat everyone with love and dignity, Doerfler said. The Encourage group meets monthly and serves as a way for parents with LGBT children to know they are not alone, he added. “Sometimes parents will blame themselves and it’s not their fault,” he said. . .
Doerfler. . . said gays and lesbians should strive to live a chaste life, which includes either abstinence or marriage, a union he defined as between a man and a woman. To Davis’s credit, he didn’t allow Doerfler’s anti-gay distortions to go unchallenged; instead, he interviewed a local mental health professional, who correctly said that efforts to change a person’s sexual orientation “[lack] scientific merit and could be unhealthy.” In fact, Davis’s reporting was refreshingly free of overt false equivalencies between LGBT-affirming support groups like the A-GSA and anti-gay “support groups” like Courage and Encourage. (TWO even received a mention!) The only error he made was in incorrectly characterizing my parents’ pro-LGBT activism as support for my “lifestyle” as opposed to my orientation and my community. In addition to this front-page article in Wisconsin, my parents’ story so inspired LGBT activists here in Burlington, Vermont that they were included in an exhibition by local liturgical artist Judith McManis titled “Prophetic Vision, Courageous Lives: LGBT Saints, Heroes & Martyrs.” The exhibition, which was displayed this summer, featured photographs of LGBT people and straight allies throughout history — some well-known, others relatively little-known — accompanied by short stories about their lives. The image McManis created featuring my parents’ story is below (click the image in order to enlarge it). As I said to the Press-Gazette, I couldn’t be prouder of my amazing parents and everything they do for LGBT equality in their community and beyond. Their love for each other is an inspiration to Michael and me, and their passion for social justice and equality for all members of the human family, including LGBT people, is what enkindled my own passion for activism. They are true heroes in my book. And thank you, dear TWO readers, for allowing me to introduce Lyle and Michele to you and indulging me as I shamelessly bragged about them. Happy Friday!